April 24, 2017 By Liz 22 Comments Note: This post may contain affiliate links. I think it’s officially smoothie bowl season. Even if you haven’t made one at home, you’ve probably seen some gorgeous creations floating around Instagram. I’m addicted to these delicious, healthy bowls! I’m always switching up my combos to keep things fresh, but I thought I’d share my 5 favorite toppings that show up frequently. 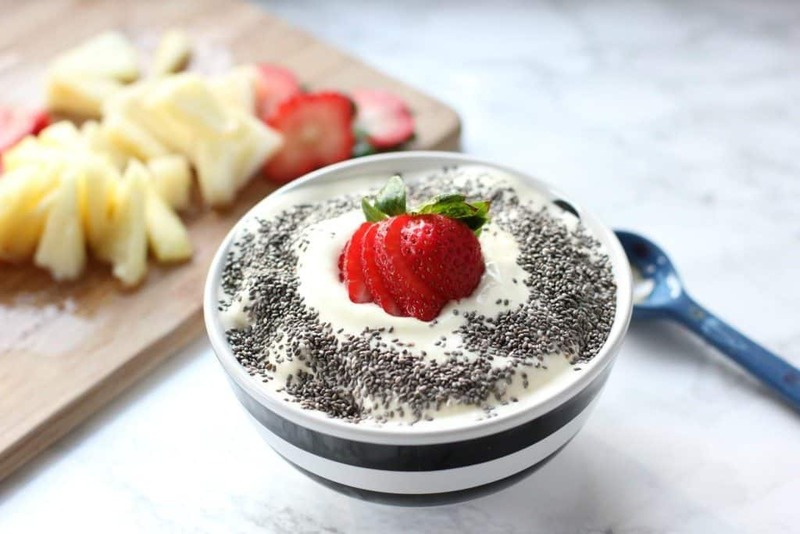 Chia seeds are packed with healthy fats and fiber! 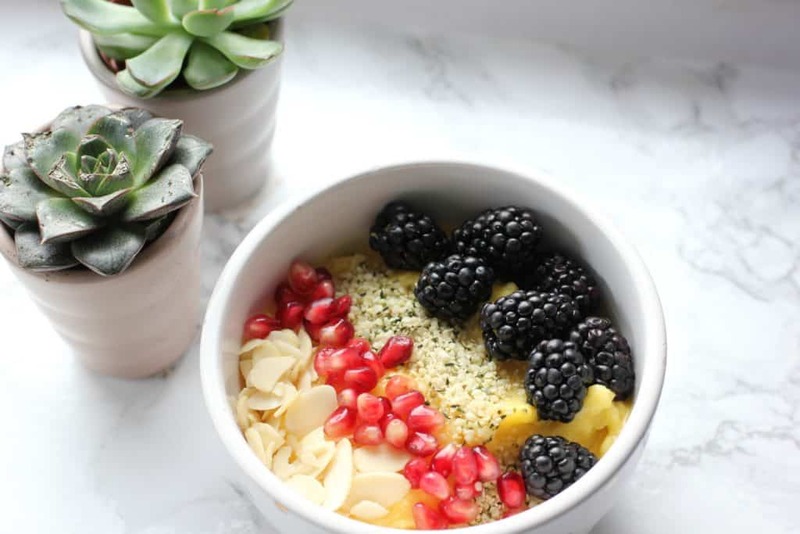 One tablespoon sprinkled on top of your smoothie bowl will give you a boost of 5g of fiber. They’re even a good source of potassium and calcium. If you’re keeping chia seeds on hand, make sure you store them in the fridge so they’ll keep longer! 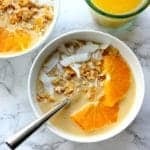 I love adding some crunch to my smoothie bowls so almond slices are perfect for this. 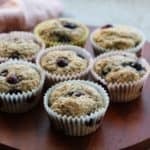 They’re an extra dose of protein, fiber, and healthy fats! Plus, they’re easy to keep around since they last for a long time. I keep a bag of sliced almonds sealed in the pantry, then I just sprinkle a handful onto my smoothie bowls! If you get them from the bulk bin, you can usually save a few bucks. If you’re craving something chocolate but you don’t want to add extra sugar to your smoothie bowl, these raw cacao nibs are perfect. They’re super crunchy and they’re basically a super dark chocolate. 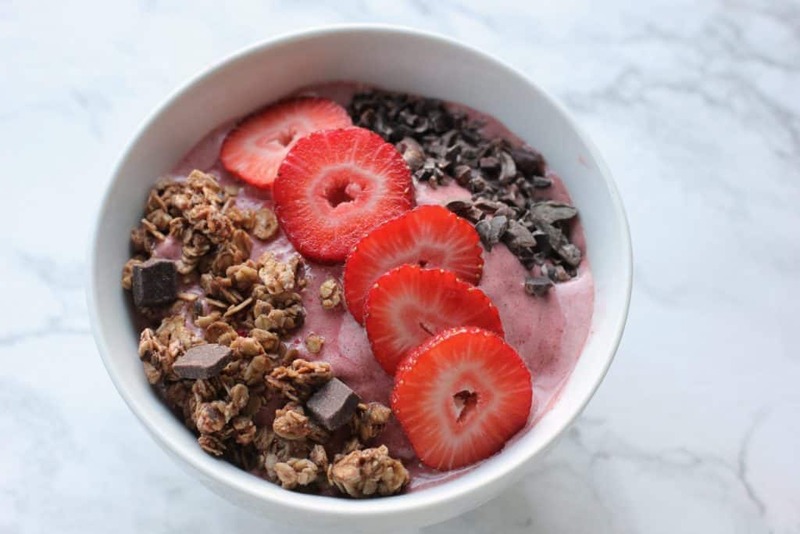 I love them in bowls with strawberries for a sort of chocolate covered strawberry kind of taste! I’ve started sprinkling some hemp hearts (hemp hearts are shelled hemp seeds) onto my smoothies because they add a nice texture with a little extra protein. One little tablespoon has over 3g of protein! It doesn’t have a lot of flavor so if you’re hesitant to mix too many flavors in there, hemp hearts are pretty neutral. 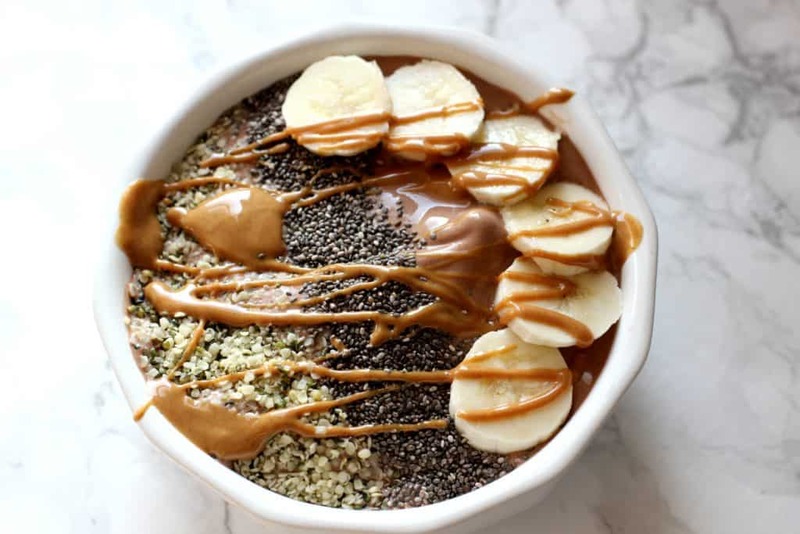 Peanut butter is probably my original favorite smoothie bowl topping. I used to just swirl a spoonful of peanut butter into my banana smoothies and call it a day. My combinations might be a little more creative these days, but I still enjoy that peanut butter and banana combination! 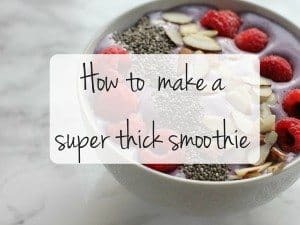 This post explains how to make your smoothies extra thick and creamy so they can stand up to toppings! 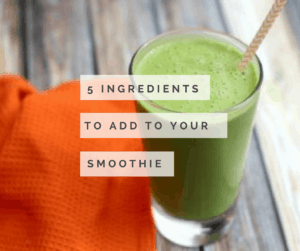 Here are 5 ingredients you should add to your next smoothie! 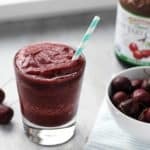 What’s your favorite smoothie topping or add-in? The peanut butter one looks amazing! You really can’t go wrong with that right? Ok, so I have yet to actually make a smoothie bowl, but all of yours always look so good. The cacao nibs sound perfect for me! I have yet to try hemp hearts. These look delicious! 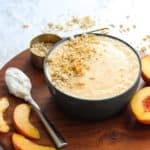 I love any nut butter but I’ve also started to drizzle coconut butter onto my smoothie bowls and then pop it in the freezer for a few minutes. The coconut butter hardens and it’s like a candy coating for my smoothie! So good! I’ve definitely been in more of a smoothie mood lately too! Peanut butter or granola are my favorite toppings! I love adding hemp hearts! Chia seeds are definitely a favorite here too! I also love shredded coconut. Never tried hemp seeds; will have to give those a whirl. Wow! 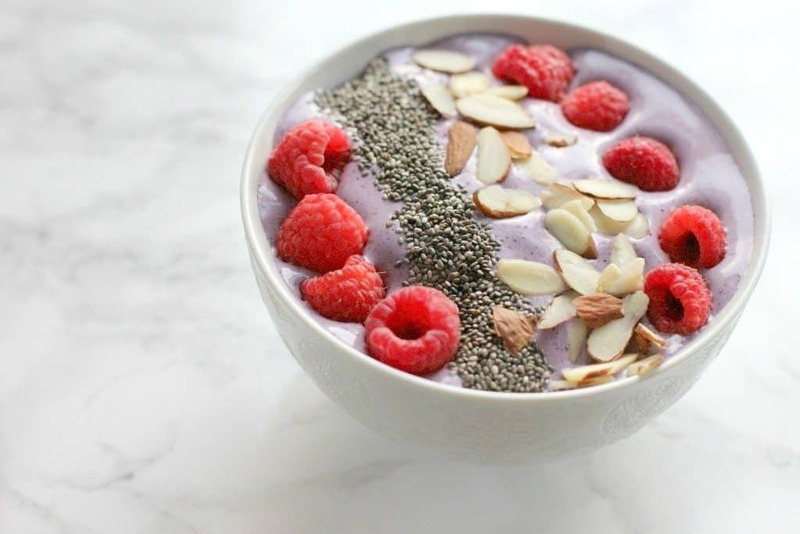 Gorgeous smoothie bowls! I love the convenience of a quick healthy breakfast! Nice. I especially like the peanut butter & banana bowl. These are great breakfast bowls! I haven’t tried a smoothie bowl yet, but you’ve convinced me. I never would have thought of using chocolate nibs, but they sound scrummy! Who wouldn’t want a healthy, protein-packed bowl of awesomeness?! Oh how I wish I had a smoothie bowl right now! I love hemp hearts too and also lots of fresh fruit, or dried. Bee pollen is nice too. These all look delicious and I am definitely having some serious breakfast envy right now. I think my favorites are the cocoa nibs and the peanut butter. Yummy! Thanks for sharing! Luci’s Morsels | fashion. food. frivolity. Those all look do amazing!!! I haven’t had one in a while, I need to fix that stat! Yes to everything on your list, especially peanut butter. Yes, it might be trendy to go all out and create little artworks on top of smoothies. But I think yours are so pretty as is in their simplicity and because you wouldn’t be afraid to actually eat them ;). Especially the various berry + nut-topped ones. I had a smoothie today and thought why don’t I do this more often? I really want to try the bowl with peanut butter now. Yum!